Card Effect(s) [Stride]-Stride Step-[Choose one or more cards with the sum of their grades being 3 or greater from your hand, and discard them] Stride this card on your (VC) from face down. [AUTO](VC/RC):Harmony [ACT](VC)[1/Turn] Generation Break 2:[Counter Blast (1) & Choose a face down card from your G zone, and turn it face up] Choose up to the same number of your rear-guards as the number of face up cards in your G zone, return them to your hand, and until end of turn, this unit gets "[AUTO](VC):When this unit attacks a vanguard, if all of your units are in harmony, choose up to three of your units, until end of turn, they get [Power]+5000, and this unit gets [Critical]+1.". Generation Rares. Ridiculous overpriced things. New Lauris is no exception. New Lauris packs Harmony and a second skill: a GB2 ACT that's once per turn. You Counterblast 1 and flip a face-down G Zone card to bounce a rear-guard for every face-up G Zone card you have, then she gains a skill: if all your units are in Harmony when she attacks, three rear-guards of your choice gains 5k and Lauris gains a Critical. My immediate thoughts turn to Glorious Bloom Ahsha, who also grants columns and gains a Critical herself. The difference is Lauris requires a bit less setup but grants less power. This is supposed to be the main finisher in conjunction with Olyvia, but out of them? I prefer Olyvia because of attack chaining and the guard quality netted from increases to hand, but again, that's not a reason not to run both. Having said that, she still sits in Olyvia's shadow. The requirements of 3 different RGs is something I'd rather live with over having to run cards with Harmony that are otherwise terrible. Her functionality over Olyvia is niche at best. I wish this unit was a bit more vanilla than supporting Harmony.dek, but I'm not a part of Bushiroad's balancing team. So, Celebrate Voice, Lauris is Harmony.dek's field steroid, for when you need to muscle past an opponent's hand and Olyvia won't cut it. During the main phase, you bounce up to as many rearguards to your hand as you have faceup G-Units. You do this to reactivate Harmony status on your rearguard columns, in case you had a full board when your turn started. But what for? Essentially Grade 3 Lauris's GB2, but better. When Celebrate Lauris swings, while your whole board is Harmonizing, you give three units 5k, and Lauris gains a crit. That's what makes the ACT portion of Lauris's skill so important. Make sure EVERYTHING is in Harmony, or Celebrate Lauris fails her field steroid. This leaves you susceptible to Denial Griffin though, so pray you draw into your copies of Emilia. Luckily, Celebrate Lauris's skill goes off before Defeat Flare though, so you'll just have to settle for passing 5k to each of your frontrow units when you're expecting your opponent to drop the Defeat Flare. 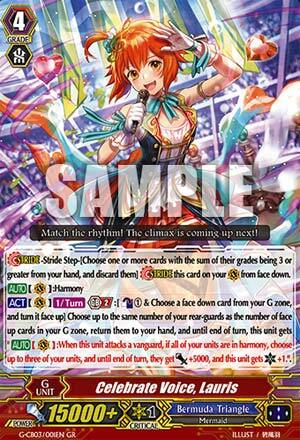 Unlike G4 Gurguit, G4 Lauris can only be activate once per turn. Shame. But the balance fairy in my ear says that's for the best, considering the effects that Bermuda uses when things are bounced to hand and called to Rearguard circle. Lauris is a 2-of, so unless you're a hoarder, you can save a bit of money trying to get this Generation Rare.